Divorce is governed by state law, and different states have different deadlines for answering interrogatories. Thirty days is typical, but a state such as Rhode Island gives you 40 days. Although states often limit the number of questions the other party can ask to about 30 queries, the questions can have a number of parts and often are written in legalese. Interrogatory questions range from queries about your assets, liabilities, and other financial information, what factual allegations you will make at trial, the identity of your potential witnesses and what exhibits and other evidence you plan to use to support your case. Even though answering interrogatories can be an onerous chore, don't delay. If you miss the deadline, you lose the right to object to any of the questions, some of which might be improper. In addition, your spouse can file a motion to compel you to provide answers. If you don't respond by the deadline, the court can impose sanctions, such as fines, or even enter judgment for the opposing party. You will be under oath when you write your answers and sign the interrogatories. So if you aren't truthful, you run the risk of perjury, or lying to the court. Interrogatories should be answered truthfully, accurately, precisely and as completely as possible. Limit your answers to the questions that are asked and don't volunteer any information that the other side doesn't request. Some attorneys use interrogatories as a form of harassment. 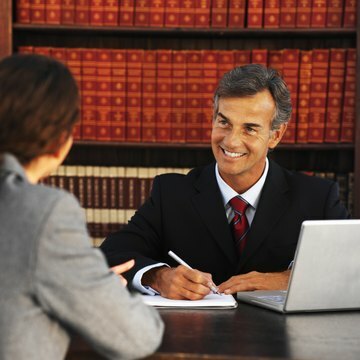 If you are asked questions that you feel are improper, you can file an objection with the court.Grounds for an objection include questions that are argumentative, vague, burdensome, oppressive, overly broad, violate attorney-client privilege or are not likely to yield admissible evidence. Examples of impermissible questions include demands for all of your medical records or your Social Security number. You can choose to object to a question and still respond to it. However, the court is unlikely to believe you are acting in good faith if you object to every question without responding to any of them.